2 x 244P 22in Barradcuda Handsaws. 1 x 2700 22in Hardpoint Saw. 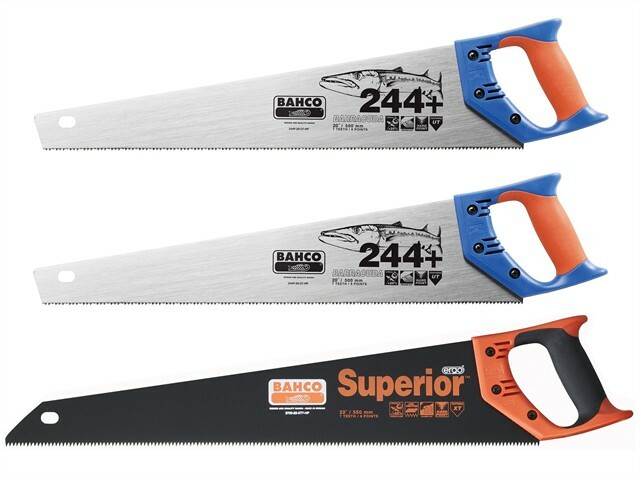 The Bahco 244P Barracuda Handsaw is a high quality general purpose hardpoint saw suitable for cutting softwood, worktops, chipboard and MDF. The Super sharp toothing and thicker blade offer faster cutting with improved stability and precision during use and the screwed 2-component handle can be used as an approximate 45° and 90° marking guide. The Bahco 2700 Handsaw has a very fast cutting performance when cutting coarse or thick materials, and is developed according to the scientific ERGO™ process.